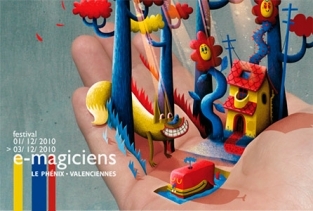 The Chamber of Commerce of Valenciennes (North of France) organises the E-magicians festival from 30th November to 3rd December 2010. It concerns students enrolled in a European school, university or educational organisation specialised in animation, film or computer graphics. Students can choose by coming to France to present their projects or to send its. There are 3 categories in which students can register: Videos - Video Games - Chained Animation. Concerning students interested in Chained Animation, they will stay at a hotel in Valenciennes during the festival, at our expenses. For the travel, they will buy their train or plane tickets, and we will pay us back at the arrival in France.